We specialize in the complete installation, deployment and support of Immersive TelePresence from Cisco Systems. Our global scale, our partnership with Cisco, our experience from several global enterprise deployments and our achievements from large and very high profile events make EOS an interesting partner for you. We hold over 35% market share of worldwide Immersive Cisco TelePresence system installations. EOS has a significant track record in Cisco TelePresence installations, TelePresence Room Remediation and technical TelePresence Support. 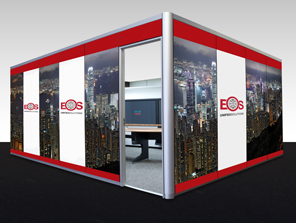 EOS has designed and developed Prefabricated TelePresence Rooms, Collab Cube & Collab Sphere, which are supporting all requirements from Cisco to achieve optimal experience quality. In Immersive TelePresence, the room environment plays an essential part in the creation of the Cisco Immersive TelePresence Experience. The EOS Immersive TelePresence Environment secures the perfect setting for optimal quality experience in Immersive Cisco TelePresence. Our state-of-the-art virtual meeting room is designed to enhance the ‘eyeball effect’ of TelePresence and is fully compliant with Cisco TelePresence CTX specifications. The unique construction of the EOS Immersive TelePresence Environment solutions reinforces stylish interior acoustic wall and ceiling panelling abating external distractions. Optimal lighting for TelePresence is provided while maintaining comfort to participants for extended periods. This environment comes with a self contained HVAC as standard and exterior wall panelling suitable for branding. Our environments are designed to provide users with an exceptional in-person experience of TelePresence hence, maximising your TelePresence investment.